(Bloomberg) -- Technology stocks have been at the forefront of the rally in Asian stocks this year, yet there’s more driving the sector than just Tencent Holdings Ltd.
Don’t get us wrong, Tencent has been a great story thus far. The stock with the single biggest weighting in the MSCI Asia Pacific Index is up about 25 percent already this year and briefly topped the HK$400 ($51) level for the first time since June 2018 today after one of its games won regulatory approval in China, according to a statement on the State Administration of Press, Publication, Radio, Film and Television’s website. But beyond Internet giant Tencent and the usual suspects in chipmaker Taiwan Semiconductor Manufacturing Co. and Korean conglomerate Samsung Electronics Co., there are other names posting even bigger gains. Let’s start in Japan, where Softbank Group Corp. and Rakuten Inc. are up around the 50 percent mark each this year, among the biggest gainers in the Nikkei 225 Index. Both have gotten a lift amid the battle of the ride-share public offerings. 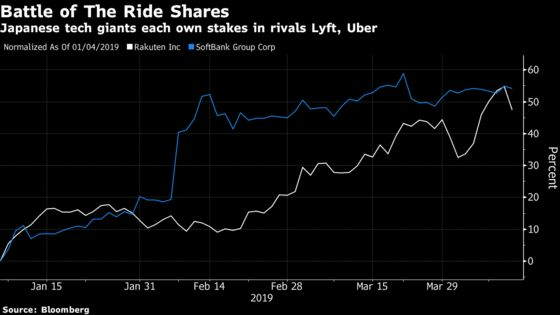 Rakuten owns an 11.5 percent stake in Lyft Inc., while Softbank awaits the pending IPO of rival Uber Technologies Inc. following its deal in late 2017 to acquire a sizable stake in the popular ride service company. Rakuten’s share price has been volatile since Lyft’s less-than-stellar trading debut at the end of March, with the new stock tumbled 17 percent in just over two weeks. The firm said April 1 it would book a valuation gain of 110 billion yen in the first quarter after an evaluation of Lyft shares following its IPO. As for Softbank, it stands to profit handsomely with Uber seeking to raise $10 billion in its IPO, kicking off a road show to market shares this month and begin trading publicly in May, according to people familiar with the matter. Over in Australia, payment services provider Afterpay Touch Group Ltd. is the top-performing stock in the benchmark stock index, with shares more than doubling this year to hit a record high Thursday. The company is a big part of the emergent WAAAX group of tech stocks (because everyone loves tech acronyms) leading a fresh wave of gains Down Under -- WiseTech Global Ltd., Appen Ltd., Altium Ltd. and Xero Ltd. The group has surged some 230 percent since June 2017, outperforming FAANG and BAT groups in the U.S. and Asia in that time, according to data compiled by Bloomberg. Over in Hong Kong, Sunny Optical Technology Group Co. is the second-best performer in the Hang Seng Index this year, up about 48 percent to rebound from its first annual loss since 2011 last year. The lens maker will see sales maintain strong growth of more than 20 percent in the next 12 months, supported by demand for its multiple-lens high-resolution handset camera from the likes of Huawei Technologies Co. and Xiaomi Corp., according to Charles Shum, Bloomberg Intelligence analyst. However, operating margins will struggle to inch higher given it’ll be difficult to boost the selling price amid greater competition, he said.